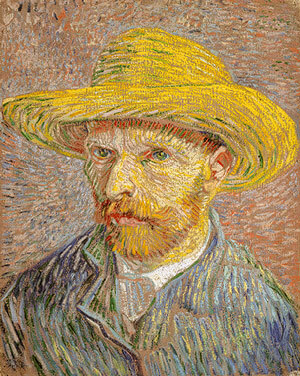 The following is Vincent Van Goghs ‘self portrait in a straw hat’. Guarding this one in the museum was always hard work. It was in the center of the room where people could walk around it to see both sides. This side shows his painting style in that of the impressionists. He created it a year after moving to France. Nobody tried to lick this painting (it was behind glass). They did however touch the glass. you have no idea how many times I had to come to the paintings rescue! People can be such pains.